Unchecked, duct leakage can be a significant added cost in any ventilation system; particularly existing laboratory buildings. The cost to condition and deliver outdoor air can range from $7 to $12/cfm per year depending on local climate and utility costs. This can make any leakage on 100% outdoor air systems extremely expensive. 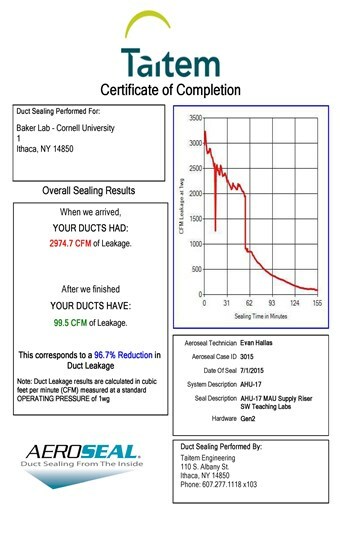 During a recent controls upgrade project at Cornell University, significant utility savings were captured through the use of a duct sealing technology called Aeroseal. The Baker Lab project initially included an upgrade the control system of a modern DDC system to address ongoing maintenance and energy efficiency concerns. During testing, balancing, and commissioning, it was identified that the existing ductwork systems had significant leakage, up to 30% in some locations. This was largely due to the existing ductwork systems utilizing clay flues in the original 1921 building construction. An Aeroseal vendor was contracted to seal all the exhaust risers and most supply risers. The Aeroseal process is completed in several steps. The ductwork in question is isolated at grilles, diffusers and upstream of any terminal reheat or VAV equipment. The ductwork is then pressurized and total leakage determined. If leakage is determined to be high enough to warrant sealing, the Aeroseal polymer is injected into the duct for approximately one hour. The polymer sticks to the edges of a leak and then to itself to seal holes up to ¼” in size. Total leakage of the duct is monitored throughout the process and a certified leakage report is provided detailing starting leakage versus the final leakage. Typical results are reduction in leakage by up to 90%. The process also identifies larger leaks that can be scoped with a camera and manually patched. For the purpose of this article, we will look only at supply leakage, as this is easily converted into energy savings. Total leakage on a single air handling unit was determined to be around 3,000 cfm. Through the Aeroseal process, this leakage was reduced to approximately 100 cfm. The reduction in leakage at the university’s standard utility rates provided an annual savings of over $20,000 dollars with payback of a several months. When applied to the whole facility, supply leakage was reduced by 15,000 cfm, for a yearly savings of over $100,000. This yields an approximately 10% reduction in total utility costs for the facility with a payback of less than one year. This technology is not appropriate for use on all facilities but is definitely worth investigating if a facility is suspected of having high duct leakage particularly in 100% outdoor air applications.